Firstly, I found design process in my cooking. 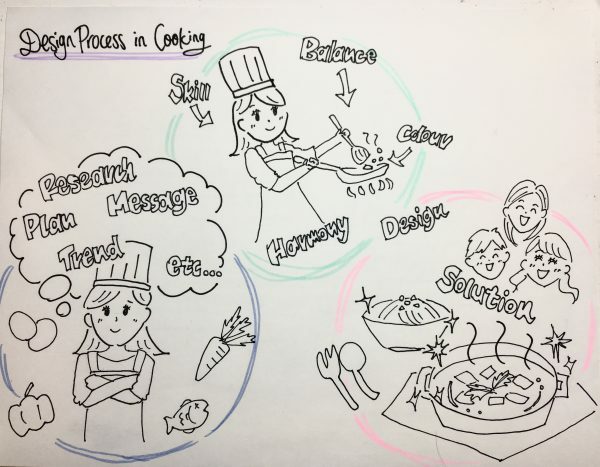 When I cook for people, I think I am often using the process which is similar to design process. I have a future plan to have own restaurant or café after many experiences, and I often cook something for my friends or family. I used to cook dishes what I want to try every time, but when I think about food for someone, my thought has been changing, and now I become to think about what they expect. When I research recipes, I also search trend and what they like, then I decide what I can cook with considering both the ideals and my skill level. For example, if the person likes dish which is really hard to cook, I will change some in the recipes (like how to flavour or ways) and make the best dish for him. When I used these process, I realized that people likes my cooking more, and I had more confidence toward them. Cooking perfectly is really difficult and needs a lot of study and practices. Also, it is important for me to analysis my skills and potential all the time. However, I found that communicating the messages with food is harder than doing with other ways because I do not use words with dishes, so people might not catch the ideas or reasons for the food. Thus, I thought the technical skills or other ways of communication may cover the problems. For example, I can create unique design of the ingredients or food by decorating in particular ways, or I can also put a short letter beside the meals if there is a message I really want to tell. By searching many alternative ideas, we can create several solutions which influence the targets. To sum up, these design processes are always help finding better solutions or own improvement.